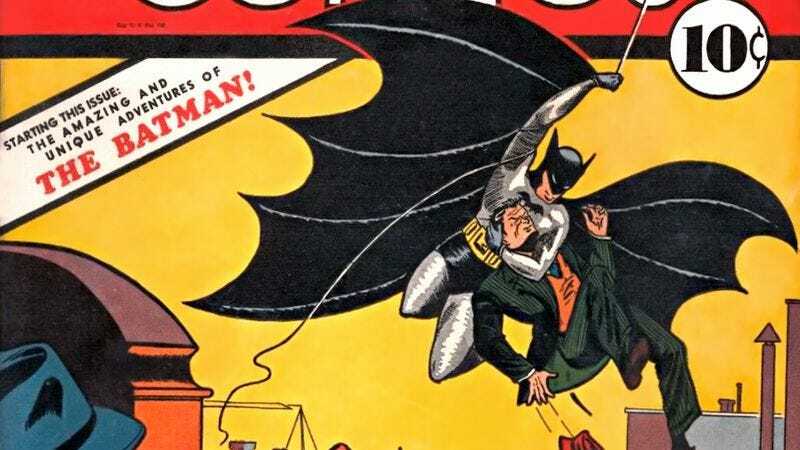 Batman is a big-time cultural phenomenon, so there’s a good chance that anyone who has encountered anything related to the caped crusader has seen the name Bob Kane. He’s officially credited as the creator of Batman, and his name appears pretty much everywhere that Batman does these days. However, comic book fans probably know that—according to most accounts—Kane wasn’t alone in coming up with (arguably, we guess) the greatest superhero of all time. As the legend goes, Kane decided to make a character called “The Bat-man” who bore little resemblance to the guy we know beyond a similar bat wing-style cape. Kane then called for the advice of Bill Finger, a ghostwriter who worked under him. Supposedly, Finger suggested replacing the red tights and old-fashioned domino mask that Kane had designed with a darker color scheme and a full cowl—which, of course, went on to be the final design. Finger also came up with the name Bruce Wayne, the name for Gotham City, and Robin’s backstory, and he even ghostwrote a lot of the original Batman comics (including the first appearances of Catwoman and The Joker). On top of all of that, he was the one who originally put a T-Rex and giant penny in the Batcave (which he also created). Unfortunately for Finger, his status as a ghostwriter meant he couldn’t claim ownership on any of that stuff, and for years any claims that he did make were mostly refuted by none other than Bob Kane. Finger died in the ‘70s, and years later Kane finally began acknowledging the contributions he made to Batman, but Kane’s name is still the only one you always see on movies, video games, and TV shows. Now, though, The Hollywood Reporter says that’s finally going to change. Beginning later this season on Gotham and on the upcoming Batman V. Superman: Dawn Of Justice, Bill Finger will be receiving some kind of credit acknowledging the work he did in the creation of Batman. We don’t know what the credit will be (“co-created by” would be nice), and THR doesn’t specify if Finger’s family will get any kind of financial benefit, but at least it’s something. Also, it’s worth mentioning that the actual comic book-publishing side of DC also acknowledged Finger’s contributions recently, giving him credit on the cover of a re-issued version of Detective Comics #27—the first appearance of Batman—last year.